Coconut – Nature’s Tropical Powerhouse. 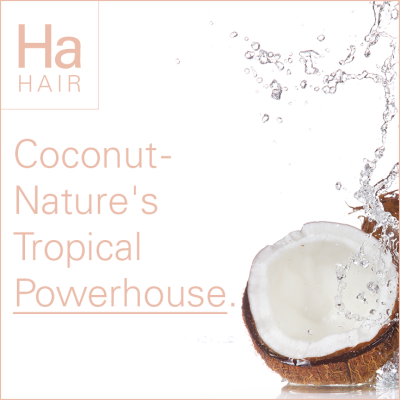 coconut is considered one of nature’s biggest powerhouses for supporting natural beauty. Coconut water is full of the beautifying ingredients potassium, magnesium, and sodium, along with small amounts of zinc, copper and selenium, which are fantastic for balancing electrolytes (better than any store bought sports drinks). When your electrolytes are properly balanced your heart will deliver oxygenated blood more efficiently throughout the body, resulting in glowing skin. The selenium found in coconut is an important anti-aging mineral that helps the skin maintain its elasticity and keeps the scalp healthy, while the zinc keeps the hair and nails looking gorgeous. Coconut oil is made of anti-inflammatory, medium-chain fatty acids that the body burns quickly and easily without being broken down by the liver. This provides an instant boost of energy and metabolism which helps burn stored fat. So now you know more about why coconut is so good for you perhaps you want to know how you can incorporate it into your life? If you have problems finding green smoothies delicious, then don’t give up on them just yet. Try adding coconut water to your green concoction to camouflage the taste and see how that works for you. Coconut oil boosts the absorption of other valuable nutrients and is stable at high temperatures, won’t produce free radicals. So try adding a teaspoon or two in your next stir-fry. Coconut flakes are a delicious snack option and tastes great on hot cereal, add some anti-oxidant rich berries and that’s a treat that can help defy the signs of aging. Use as a natural alternative, externally. Coconut oil is powerful internally but is equally as powerful externally. One of the simplest ways to use coconut oil is to rub it directly onto the areas that need it the most. You could do this after a shower in place of your regular moisturizer. Apply to the scalp and hair to enhance the texture and eliminate any dry skin that my lead to dandruff. Coconut oil is also great for removing water-proof mascara! 2 Responses to Coconut – Nature’s Tropical Powerhouse. Thanks Carla Davis for your information. Great! But people say that coconut oil has a bad odour is this true?